Hey all! If you're reading this post, that means we have survived a water outage, sick kids, the Polar Vortex 2019 and more sick in our house. Whew. It's been a long two weeks and I'm breathing a sigh of relief as it's time for the Weekly Wrap link-up! 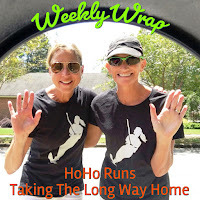 I am excited to have the opportunity to guest co-host this week :) Check out the link-up at the bottom of my post and here's my wrap up for (technically the past two) week(s). As you have likely heard (and felt) week, the good ole' Polar Vortex put the Midwest in a deep freeze on Tuesday and Wednesday. Brrr. Seriously. BRRR! In our part of northern MN, the worst we saw was a windchill of around -57°F; a low that hasn't been touched in at least a decade they say. Honestly I don't remember the last time it's been this cold! While the water was out for 24 hours in our neighborhood during this past two-week stint, thankfully our electricity stayed put and our houses were warm and cozy. Just so happens our middle boy threw up the night of the water outage. Isn't that the way it works! I nominated the Polar Vortex week to also be called "Treadmill Appreciation Week". As there is no other way I would have gotten any miles in, with sick kids nor the cold, without our faithful Proform! Up until I got the stomach flu myself (Thursday), I kept up with regular marathon training runs via the 'mill. Currently we're staying cozy here and the temps are warming slightly, to a glorious +15°F, so the older kids went outside. The public school cancelled two days this week but we managed to finish a full week of homeschool, even with mom being sick! I'm still recovering from the flu and my husband is now sick. Oh, and we're closing on our house and likely moving this month, too. I should be packing right now. I'm feeling a bit overwhelmed at the moment, can you tell?! Let the winter crazies continue and by God's grace our family is making a slow return to full health. Look on the bright side: We made it to February, there's hope in March and maybe even t-shirt weather in April. Just get me out of this winter sickness funk! SUN: (Treadmill) Easy 6.2 mi, 54:29 @ 8:47/mi. Strength: Hams/Glutes. 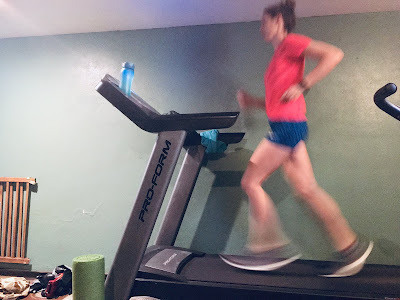 MON: (Treadmill) Speedwork 5.00 mi, 41:33 @ 8:16. 1 mi WU, 4x400m @ 7:30/mi, 4x400m @ 7:00/mi with 400m easy pace recovery. Strength: Lunges and squats. TUES: No running; finished the Poseidon full-body strength workout from yesterday. I can see slight improvements in my upper body strength; like actually being able to do "real" pushups now! WED: (Treadmill) Tempo 5.01 mi, 42:02 @ 8:23 avg. 1 mi WU, 1 mi @ 7:30, 1 mi easy, 1 mi @ 7:30, 1 mi easy. Feeling exhausted, like I'm coming down with something. Strength: Bia hip strength circuit. THURS: Woke up at 5 am with the stomach flu. Gah! Basically laid around all day, watching kids while trying to "rest" and not pass out. FRI: I felt much better though very weak this morning and dedicated all energy that had returned to sanitizing our house. Hope to resume running tomorrow. SAT: Flu "Recovery" Run 3.12 mi, 25:31 @ 8:11/mi, feeling okay but still weak and stuffed up in my sinuses. Strength: Hams & glutes. Ugh to the sickness! I'm so glad you kept a positive attitude about it all. Yep, there was treadmill appreciation for me too. Thanks for co-hosting! Oh my gosh, what a week to catch the flu -- although I guess you weren't sad you couldn't go outside? Glad you all are feeling better. Thanks for co-hosting the link-up! Oh no! that's a lot on your plate. I hope everyone feels much,much better sooner rather than later. My ancient treadmill is getting a lot of action this winter, but thankfully I only had to use it for one run this week. Everyone really did a great job getting their workouts in with the crazy weather. We were way colder than normal in DC but nothing like what you had. Hope everyone is feeling better! Oh man, that was quite the week for you! I am glad that you started to feel better over the weekend - that stomach bug seems to be going around a lot the last few weeks! I love that phrase - Treadmill Appreciation Week, lol. I definitely felt that way as well. I hope this cold weather is over for good. I don't own a treadmill so I have had to brave the cold. I survived. Kudos on getting in the runs while packing, being sick, the cold and taking care of kids. Hope this week is better. Sorry to hear about the flu. My husband has had it since last weekend, but I've managed somehow not to catch it (OK, I've been avoiding going near him and washing my hands / barking at him to wash his almost constantly. I don't have a treadmill so have to slither round the corner to the gym if I can't run outside, This year so far in this bit of the UK is far less icy and snowy than last year. My friend was supposed to do a 135 mile run in International Falls but had to DNF because of the extreme cold. 15 degrees is balmy! Here in Chicago we hit 45 today and I ran in shorts. Crazy weather. LOL at treadmill appreciation week! I'm so glad that so many of you in Chiberia have treadmills at your disposal. I have to rely on driving to other places, read: the Y, and use their antiquated equipment OR I have to put on my big girl pants and go out in the cold. Thankfully, we don't get that cold here in southeastern VA. It did get cold, though. We were in single digits for a day and never got out of the 20s at the warmest part of the day. I heard lots of complaining in my circle of friends about having to run on the treadmill. Not me, I love mine! It's such a great tool to have in this weather. Ugh on the flu. Glad it passed fast. OMG. We have lost water due to hurricanes and that's terrible enough. I can't even imagine being stuck in the polar vortex and not able to take a hot shower to warm up. Thank goodness your electricity stayed on! Great job on your workouts! your training is going well, it looks like! I can't imagine it being that cold! Actually I can as I visited North Dakota several years ago and it was -50 with the windchill, but living in Florida has definitely chilled out my blood! Kudos to you for continuing to marathon train on the treadmill! I don't think I could do that. Wow you have had a lot on your plate! Hope everyone feels better soon! Great job getting your workouts in. I think you win on coldest weather! I'm so relieved the worst seems to be over. Your training workouts look great! I've been thinking about getting a Proform treadmill, what model do you have? Hope everyone is feeling better at home! Yes, I'd definitely be appreciating a treadmill with those temps. That temperature doesn't even compute for me. As a coastal Southerner (Charleston), I think it's cold when it's below 65 degrees. Oof, what a week! I hope the stomach flu is done with your house. Good job getting the runs in with all that! Sounds like a really tough week with the plumbing issues, the flu and the cold temperatures all at the same time! I hope that's the worst of it for this Winter. Tough week - but great work on your training! I am ready for warmer weather to stick around! The weather here in Chicago has been much the same. It's in the upper 40s today and it feels like a heat wave! I remember when I was a senior in high school when the wind chill was -72 degrees. Insane. I also remember having to have my car jumped because the battery was dead. Good to hear your family is getting on. It's no fun having sick kids - especially when everyone is stuck at home. Sorry to hear about the flu! Hope you're feeling better! There's nothing worse than sick kids and a sick mummy! Well done on getting it all done, including home schooling! Oh wow. Flu + vortex + no water has to be the worst combo ever. I hope that bug is outta there pronto! Isn't it funny how +15 can feel so warm?? Oh my goodness, what a week you had with extreme cold, no water, and sickness throughout your house. I hope this week is going much better!